JAKARTA (Reuters) - Indonesia's president said on Tuesday a radical Muslim cleric linked to the 2002 Bali bombings would only be released from jail if he pledged loyalty to the state and its ideology, after news he would be freed unconditionally sparked criticism. 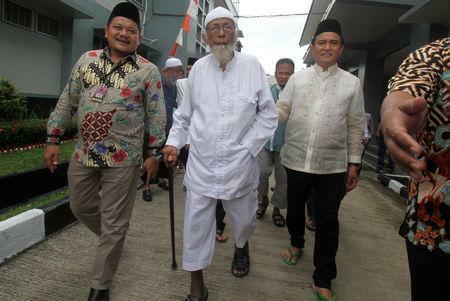 President Joko Widodo had declared last week that Abu Bakar Bashir, 81, would be freed on humanitarian grounds, citing his age and poor health. A legal adviser to the president had said the cleric would be granted unconditional release. But Widodo said in a statement on Tuesday it would be "conditional release", a day after the chief security minister said the decision was being reviewed. But Bashir's lawyers say he has refused to do that. Bashir was the spiritual leader of Jemaah Islamiah (JI), an Islamist group linked to al Qaeda blamed for the 2002 bombing of nightclubs on Bali island that killed more than 200 people, most of them tourists, including 88 Australians. He was convicted in 2010 under anti-terrorism laws for links to militant training camps in Aceh province and jailed for 15 years. "We have been very clear about the need to ensure that as part of our joint counter-terrorism efforts … that Abu Bakar Bashir would not be in any position or in any way able to influence or incite anything," Morrison told reporters on Monday. Widodo has also come under fire at home over the possible release. Critics have accused him of trying to win over religious conservatives ahead of a presidential election set for April 17 in the world's largest Muslim-majority country. Opponents and hardline Islamists have repeatedly attacked Widodo's Islamic credentials. During the 2014 campaign for the presidency, he had to battle false rumours he was a communist. In a move to shore up Muslim support this time, Widodo picked for his running mate an Islamic cleric. Still, some analysts doubted whether releasing Bashir early would win Widodo many conservative voters. Security and government officials, who declined to be identified due to the sensitivity of the issue, said they backed the plan to release Bashir to avoid the risk of him dying as a martyr in jail, but felt doing so without conditions was risky. Another official said the government was considering letting Bashir out of jail but placing him under house arrest. Indonesia-based terrorism expert Sidney Jones told Reuters that waiving the requirement for Bashir to pledge loyalty to the state and secular state ideology would have set a dangerous precedent. "It risks turning him into even more of a hero because it's like he has succeeded in defying the state," she said, speaking before Widodo set conditions on the release. "The end result is that Widodo ends up looking weak, out-manoeuvred and poorly advised." Bill McNeil, an survivor of the 2002 bombings, told The Australian newspaper that he found the prospect of Bashir's release hard to understand.